A liquid storage tank stands twisted at the Fukushima Daiichi Nuclear Power Plant. 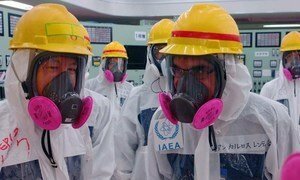 Radiation leaked after Japan's Fukushima nuclear disaster in 2011 is unlikely to make the general public and the majority of workers sick, a United Nations scientific committee today said previewing a new report. “Radiation exposure following the nuclear accident at Fukushima-Daiichi did not cause any immediate health effects,” the UN Scientific Committee on the Effect of Atomic Radiation (UNSCEAR) today said in a news release. “It is unlikely to be able to attribute any health effects in the future among the general public and the vast majority of workers,” the Vienna-based committee added. The finding comes from a report in which more than 80 leading international scientists analysed the available information on the levels and effects of exposure following the March 2011 events in Japan. That draft report was scrutinized by 27 countries on the Scientific Committee during its 60th session which started on 27 May, and is now being revised and finalized for presentation to the UN General Assembly. “The Report has the full confidence of the Committee,” said the UNSCEAR chair, Carl-Magnus Larsson. The actions taken to protect the public, such as evacuations and sheltering, significantly reduced the radiation exposures that would have otherwise been received, concluded the Committee. “These measures reduced the potential exposure by up to a factor of 10. If that had not been the case, we might have seen the cancer rates rising and other health problems emerging over the next several decades,” said Wolfgang Weiss, Chair, UNSCEAR report on radiological Impact of the Fukushima-Daiichi accident. The committee added that no radiation-related deaths or acute effects have been observed among the nearly 25,000 workers at the accident site, nor it is likely that excess cases of thyroid cancer due to radiation exposure would be detectable. A 9.0-magnitude earthquake created a tsunami that in addition to killing 20,000 people, slammed into the Fukushima Daiichi nuclear power station, disabling cooling systems and leading to fuel meltdowns in three of the six units. The incident was reported to be the worst nuclear accident since the 1986 Chernobyl disaster. The committee drew on lessons from that disaster during their discussions this week. “The experience from the 1986 Chernobyl accident has shown us that apart from any direct impact on physical health, the social and societal effects, and their associated health consequences in the affected population will need special attention in the coming years,” Mr. Larsson said, noting the importance of long-term medical follow-up. In addition, the session focused specifically on the potential impact of radiation on children, which are affected differently by radiation. “More research is needed to fully understand the risks and effects following childhood exposure to radiation,” said Fred Mettler, Chair, UNSCEAR Report on Effects of Radiation Exposure on Children. In February, the UN World Health Organization (WHO) released a report in which it argued that health risks associated with the Fukushima Daiichi nuclear power plant incident in Japan such as cancer are low overall. The “Health Risk Assessment from the nuclear accident after the 2011 Great East Japan Earthquake and Tsunami based on preliminary dose estimation” reported, however, that for people in the most contaminated area, the report estimates that there is a 70 per cent higher risk of females exposed as infants of developing thyroid cancer over their lifetimes. In addition, the risk of leukemia increased by 7 per cent for males exposed as infants, and for infant females there is a six per cent higher risk of contracting breast cancer. The report also notes that one third of the emergency workers who were inside the Fukushima nuclear power plant have an increased risk of cancer. Meanwhile, a UN-organized four-day workshop on further strengthening nuclear and radiological emergency preparedness and response capability today wrapped up in Fukushima. More than 40 participants from 18 countries took part in the Response and Assistance Network (RANET) workshop organized by the UN International Atomic Energy Agency (IAEA). The workshop is the first activity conducted by the IAEA RANET Capacity Building Centre which opened earlier this month. The Centre, created by the UN agency and the Government of Japan, is home to several IAEA activities aimed at enhancing emergency preparedness and response capacity, both in Japan and worldwide, in light of the Fukushima Daiichi Nuclear power plant accident. Although Japan has made progress towards stabilizing the damaged reactors of the Fukushima Daiichi nuclear plant crippled by a devastating earthquake two years ago, there are still issues to be resolved before it can begin its deactivation, the United Nations atomic agency said in a report released today.